Most people run out of teenagers’ lives. And with good reason … they are nuts! Developmentally they are all over the place, everything is red-lining, off kilter or running wild. But as a youth worker – we run into their lives. When I meet people on airplanes while traveling, as soon as I tell them I work with teenagers they just shake their head in awe. If I could read their minds, I’m sure I would hear, “Ha! This guy is nuts … you couldn’t pay me enough to work with teenagers.” And while the “you can’t pay me enough” part is true, I love running into the mess of their lives. Over 20 years in youth ministry there’s nothing I haven’t seen. I’m ready and prepared to care for students in the rollercoaster thrill ride of young adulthood. I think Jesus knew this feeling better than we think. Historians tell us that many of the disciples were very young men, several of which were probably still in their teenage years. 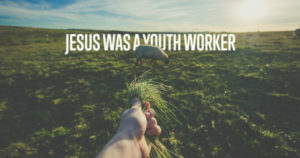 So my first big observation is… Jesus was a youth pastor! YES! Sweet vindication! I think Peter may be the perfect, Biblical example of what it looks like to mentor a teenager!